JANUARY 2019 | Fun Things To Do In Myrtle Beach & Grand Strand. 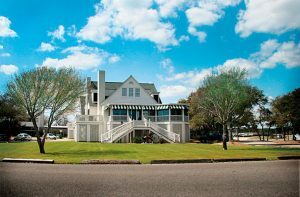 The Trembley Group Real Estate Sales Professionals are often amused by the out-of-town home buyers who believe that Myrtle Beach and the Grand Strand turn out the lights and lock the door in the winter. Nothing could be further from the truth. Winter is the favorite season for many of the company’s Sales Professionals. The Grand Strand and Myrtle Beach fun never stops. There’s something here for everyone, every season. If someone thinks Myrtle Beach shuts down during the winter, well, they better think again! There’s so much to do during the off-season in Myrtle Beach. Plus, with less crowds, there will likely be shorter lines at attractions, little to no wait at restaurants, and plenty of elbow room on the beach or on the links. While our friends living in the northern US and Canada are cold, frozen and shoveling snow, year-round residents of Myrtle Beach and the Grand Strand are enjoying the mild winter weather and the many fun attractions Myrtle Beach and the Grand Strand have to offer. The Grand Strand has long been known as the home for fun activities and endless entertainment, and that doesn’t even begin to slow down in the winter. There are a wide variety of winter events that Myrtle Beach residents can enjoy. And there’s less traffic and smaller crowds during this time of year, too. Folks living along the Grand Strand enjoy all their favorite activities at a more leisurely pace. 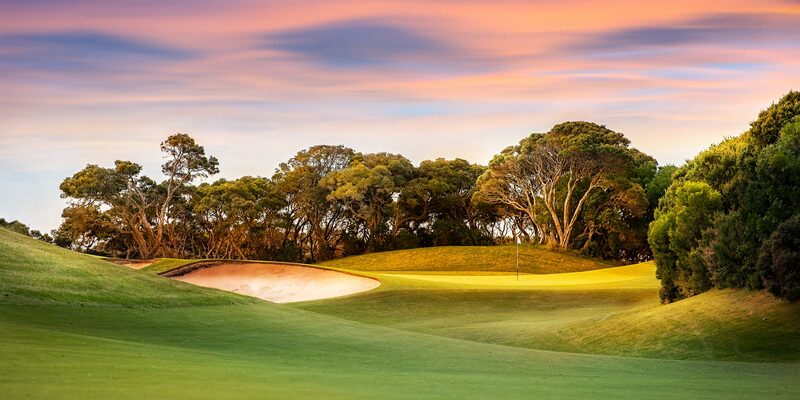 And everyone looks forward to the mild winter climate, perfect for enjoying an afternoon stroll on an uncrowded beach or playing a round of golf. January Myrtle Beach high temperatures average 56 degrees with night-time lows averaging just above freezing. At 51 degrees, the ocean temperature is a bit too chilly for a dip, but the beach is always a great place to watch the sun rise, take a scenic evening stroll, or enjoy a leisurely mid-day picnic. The off-season also tends to be more lenient when it comes to having pets on the beach. Pet-loving Trembley Group Real Estate Professionals often enjoy bringing their favorite furry friend along on their beach adventures. Myrtle Beach and Grand Strand residents can take advantage of smaller crowds and still take advantage of the sun and sand. While many restaurants have closed up shop for the season, relatively inexpensive holiday deals are available for many restaurants and shows. There are endless winter shows and events that take place in and around Myrtle Beach during the winter. And of course, the shopping is discounted this time of year. Myrtle Beach and the Grand Strand have all the shopping you could ask for, with options like Tanger Outlets and Barefoot Landing. Fewer people in the Grand Strand area during the winter months make it easier to get on the courses of your choice. Tee times are relatively easy to grab – typically at comparatively low prices. There’s never a better time than winter to play some of the top courses in Myrtle Beach and along the Grand Strand. Not a golfer? The state and private parks and the wildlife areas in the area have miles of bicycle and hiking/jogging paths and January weather couldn’t be better for cycling and hiking. Lack of bugs and there are more miles of hiking and cycling trails on the Grand strand than you could see in a year. Those not interested in outdoor activities in the winter can find lots of ways to keep their minds and bodies active in Myrtle Beach, and along the Grand Strand. Just a few miles up Highway 501 in is the Conway Glass Studio. Conway is a short twenty minute drive from the shore in Myrtle Beach. It is the county seat of Horry County (pronounced “oh-ree”) and is part of the Myrtle Beach metropolitan area. It is the home of Coastal Carolina University and Horry-Georgetown Technical College. Conway is one of the oldest towns in South Carolina. Early English colonists named the village “Kings Town” but soon changed it to “Kingston”. The town was founded in 1732 and was laid out on a bluff overlooking the Waccamaw River, in what is now Horry County. Conway Glass hosts free glass blowing demonstrations for Conway, Myrtle Beach, and Grand Strand residents and visitors. Here, visitors to Conway Glass can learn about the ancient craft of glass blowing. Glass Blowing classes are also held October through April. Since molten glass become workable in 2150 degree furnaces, a glass blowing demonstration is a perfect January activity. Visitors to Conway Glass can watch local glass blowers create colorful bowls, ornaments, and vases from molten glass using traditional glass blowing techniques. Each demonstration is approximately one hour and a different glassblowing technique is featured each month. The demonstration is free, and is family-friendly and fun for all ages. Conway has a number of historic neighborhoods and is home to a growing local arts community, including an active local theater group and the Conway Glass Center. Serving the area since 1986, Conway Glass is a full service glass company located in the historic Mayfair neighborhood of Conway. Located at 708 12th Avenue, three blocks off Main Street, the location houses four professional art studios: a stained glass studio, a dye studio, a fiber studio, a glass blowing studio and a gallery. The location has become a destination for visitors to the Grand Strand, and a gathering place for local artists and art enthusiasts. Conway Glass is owned by Ed Streeter, a glass artist living and working in Conway since 1986. He shares his Conway studio with his wife Barbara. Ed teaches glass blowing classes every October through April and the couple welcomes thousands of visitors to their newly renovated 100-year-old historic building. The public, narrated glass blowing demonstrations are held on the first Saturday of every month October through April. Ed Streeter was awarded a Quarterly Artist Project Grant by the South Carolina Arts Commission for the 2019 fiscal year. 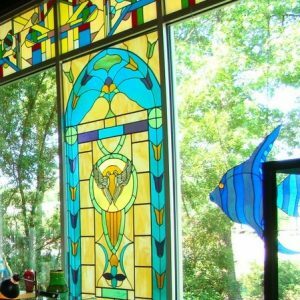 Ed first learned to cut flat glass for window frames and doors, and then apprenticed in the stained glass department of a Myrtle Beach glass company. His career in glass spans 40 years. Many Horry County churches have windows designed and created by Ed. He has educated hundreds of students in the art of stained glass. Most notably, he has taught glass blowing classes for the past seventeen years. Although much of his time is spent managing Conway Glass, his passion is creating glass art. He now focuses his creative energy on creating stained glass windows and blown glass commissions. Ed’s wife, Barbara, maintains the fiber studio and natural dye studio at Conway Glass. She works with artists to create public art in their communities. She creates colorful compositions by crocheting, knitting, stitching and dyeing materials, sometimes incorporating blown glass, mixed media and found objects. The goal of the First Saturday Glass Blowing Demonstrations is to enable visitors to see and learn about the traditional craft of glassblowing. On the First Saturday of every month, now through April, Ed Streeter explores and demonstrates various traditional and experimental glass techniques. “At First Saturday Glass Blowing Demonstrations, I strive to engage the audience, and enjoy keeping our events fresh and interesting. We do this by introducing new and innovative ideas along with demonstrating traditional glass blowing techniques,” said Ed Streeter. The Trembley Group Real Estate Professionals love to eat and are excited about the Myrtle Beach American Culinary Federation’s 22nd annual Souper Supper in the International Culinary Institute, right around the corner from their offices at The Market Common. Nearly fifty chefs from the area will compete in two categories- Judge’s Choice and Overall Winner. Entries range from vegetarian and broth-based selections to seafood chowders and exotic flavors. Enjoy over forty soups, as well as bakery items, sweets and drinks. Warm up with some delicious food, and see who takes home this years awards. Previous winners included Green Chili Chicken Soup, Low Country Alligator Chowder, Brandy Scented Peach Bisque, Chicken Chorizo Corn Chowder, Smoked Chicken Vegetable, and Sweet Potato Soup with Maple Bacon Nut Cluster. This annual winter event raises scholarship money for students attending the Culinary Institute and Academy of Technology and Academics. Tickets are $12 for adults and $7 for children, ages 12 and under, and include all the soup you can eat plus baked goods, desserts and a live cupcake decorating station. There is a small additional fee for purchasing tickets online. (704) 957-5118) Visit www.myrtlebeachacf.com for more information. Hope to see you there. The Trembley Group Real Estate Professionals love everything about living in Myrtle Beach and along the Grand Strand including the area’s rich history and southern culture. One way to experience the area’s culture is just a short drive down Farrow Parkway from The Trembley Group Real Estate offices in the Market commons. It is the Franklin G. Burroughs & Simeon B. Chapin Art Museum. The museum is housed in a charming 1920s beach cottage and features eleven galleries that change throughout the year, making it a must-see, year-round. Since 1997, the Myrtle Beach Art Museum has featured local through international exhibits of paintings, textiles, sculpture, photography, video, ceramics, assemblage and more. Plus, there are always special adult and children’s programs. The Art Museum is dedicated to being one of the finest visual arts museums in the Carolinas. Its eleven gallery exhibitions change throughout the year as the museum features artists and their works, including paintings, textiles, sculpture, photography, video, ceramics, assemblage, collage — almost anything the artistic imagination can construct. They have featured artists of national renown, such as Ansel Adams, Frank Lloyd Wright, Norman Rockwell, John James Audubon, the Gee’s Bend quilters and Jasper Johns, as well as some of the region’s most celebrated names, including Jonathan Green and Brian Rutenberg. One of the museum’s January exhibits is Collection Connections | A Visual Exploration of Southern Heritage. It is an exhibition of approximately forty works from the Art Museum’s rich permanent collections, including antique maps and historical prints, works on paper by Southern artists, including William H. Clarke, Cassandra Gillens and Jonathan Green, fabric quilts and photographs. Using Southern-history-themed works of art from our collections, the exhibition uses the visual arts to teach and explore the history and culture of South Carolina and the entire region, and is designed for both school students and adults alike. One of biggest attractions of Myrtle Beach and the Grand Strand is immediately to the east – more than sixty miles of white sand beaches and the Atlantic Ocean. Many agree that there is no better way to enjoy the water than from a boat. 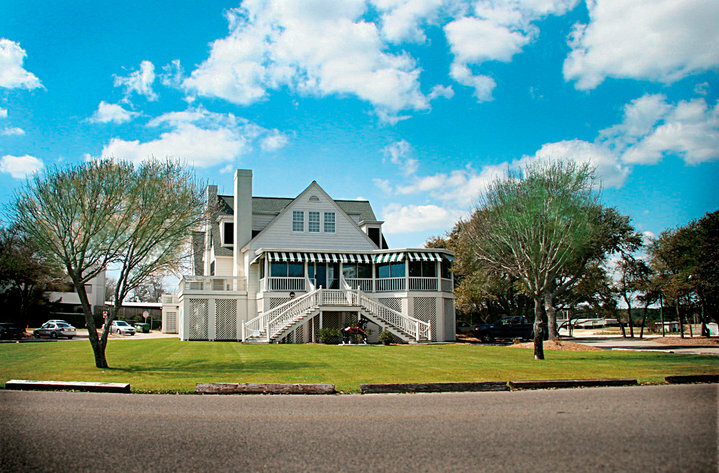 Many of the Trembley Group Real Estate Professionals and their families enjoy the area from their boats. Virtually all the major boating and fishing events in the Myrtle Beach area take place on the water, such as the Atlantic Ocean to the east and the Intracoastal Waterway to the west. But perhaps the biggest aquatic and angling gatherings of the year is held on dry land at the Grand Strand Boat Show & Sportsman Expo at the Myrtle Beach Convention Center on January 4th through 6th. The Expo features three days of everything boating, fishing and hunting. For most outdoorsmen and outdoorswomen, the Grand Strand Boat Show & Sportsman Expo is the highlight event of the year. The Expo features hundreds of boats, motors and extras for sailing the Atlantic and the Lowcountry’s lakes and rivers, as well as countless fishing and hunting accessories, all under one roof. The 36th Annual Grand Strand Boat Show & Outdoorsman Expo also offers dozens of seminars and demonstrations from some of the biggest names in the industry. Visitors can stroll around the main ballroom and see demonstrations of new equipment and products, including cutting edge gadgets like fish finders and GPS.